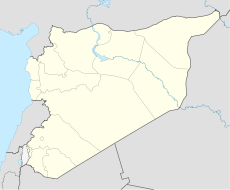 Deir ez-Zor Airport (Arabic: مطار دير الزور‎) (IATA: DEZ, ICAO: OSDZ) is an airport serving Deir ez-Zor, a city in northeastern Syria. Due to the city's close proximity to the Iraqi border and a recent Israeli military attack on a suspected nuclear facility nearby, foreign travellers to this airport can expect close attention by Syrian security services. The airport resides at an elevation of 700 feet (213 m) above mean sea level. It has one asphalt paved runway designated 10/28 which measures 3,000 by 45 metres (9,843 × 148 ft).